Therese’s sole larvae (Aseraggodes therese) were raised from wild-spawned eggs at 77-79F on wild copepods and artemia. First record of Therese’s sole culture. 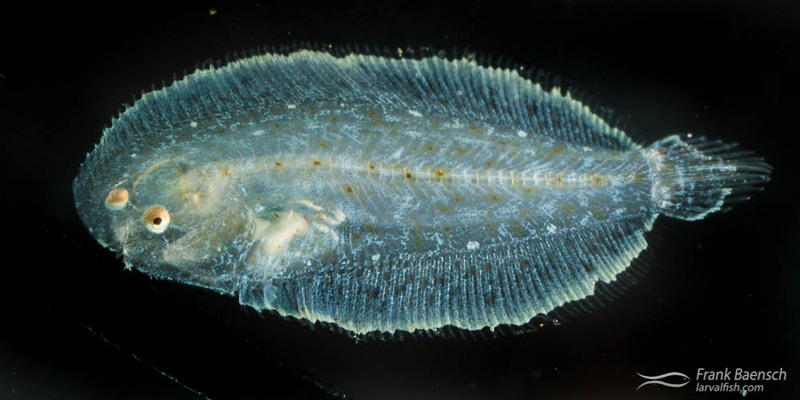 The true soles are small to moderately sized, sluggish, bottom dwelling flatfishes, comprising 22 genera and 89 species. They occur in freshwater and saltwater and feed on benthic invertebrates. Some soles are important food fish species and several species are cultured commercially. Sole eggs were frequently collected throughout the year in neuston net tows here off Oahu. This is not surprising since sole eggs have a longer development period to hatching (3-4 days) than eggs produced by most other Hawaii pelagic spawners (less than 24 hours). Juvenile Therese’s sole (Aseraggodes therese) raised in the laboratory. Therese’s sole (Aseraggodes therese) was reared from a small numbers of eggs to the juvenile stage numerous times in 2012 and 2013. The eggs have multiple, scattered oil globules and measure about 1.2 mm in diameter. Egg development period to hatching is about 70 hours.Features of the larvae include a bilaterally compressed body; a large, deep, protruding gut with a thick intestine; several white spots on the fin folds that become more numerous with age; and a left eye that migrates onto the right side of the head during the juvenile phase. The larvae settle between day 25 and 30 and go through an extended juvenile period during which the eye migrates. Juveniles grow very slowly. Therese’s Sole (Aseraggodes therese) larvae raised in the laboratory. A. therese larvae are easy to rear and don’t require the nutritional benefits of copepods. In fact, because sole larvae are slow moving ambush predators they grow faster on prey with a slower escape response, such as Artemia sp.. The unique development and feeding behavior of sole larvae and juveniles makes experimental culture worthwhile.